Couponista Queen received compensation and/or promotional products for this post. All opinions are 100% authentic. Couponista Queen is a Good Cook Kitchen Expert, and I am excited to give you a chance to WIN what is in my kitchen drawer! YES, that is correct. Good Cook allowed me to select 15 items that I wanted in a kitchen drawer, and then they challenged me to create a signature recipe using as many of those items as I could. 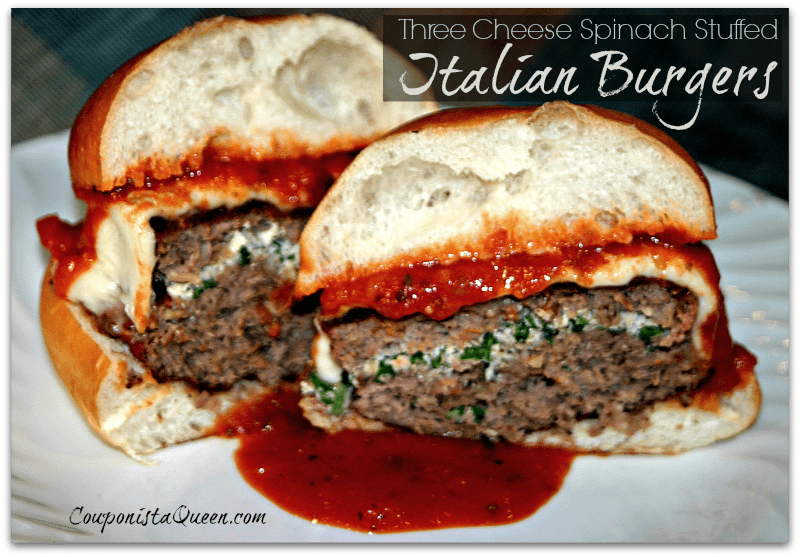 I love Italian food, and long ago my grandma and my godmother taught me to make meatballs, so I adapted that recipe into a burger that is delicious and perfect for summer grilling. Scroll down for the recipe, but first let me tell you how to win and give you a peek at what I selected for my Good Cook Kitchen Drawer. 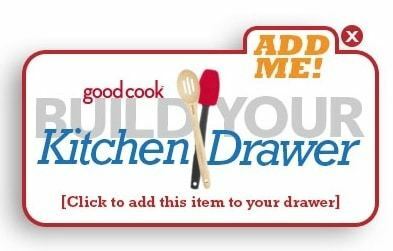 Beginning June 2 (through Juny 14, 2014), visit GoodCook.com and build your ideal kitchen drawer filled with 15 great Good Cook tools and gadgets. You can then register a drawer every day for a chance to WIN IT! Can’t decide? You can also select MY Kitchen Drawer, or take a look at the Kitchen Drawers submitted by the other Good Cook Kitchen Experts and enter one for a chance to win. Every drawer entered could win an instant prize! 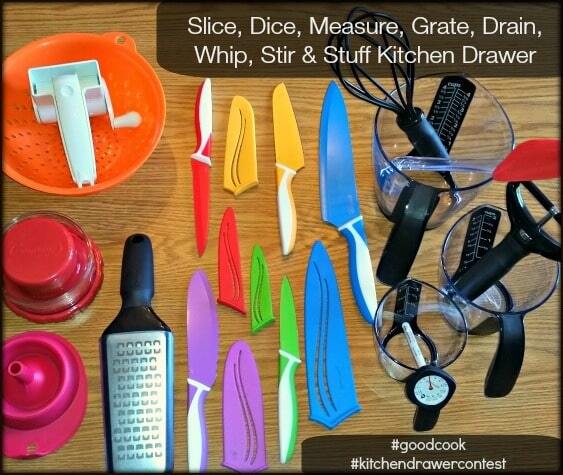 You can also participate in a 5-day kitchen gadget giveaway on the Good Cook Facebook page June 2-June 7, 2014 to win even more. During the contest, selected items on GoodCook.com will be 25% off, and entering a drawer might get you some additional discounts! 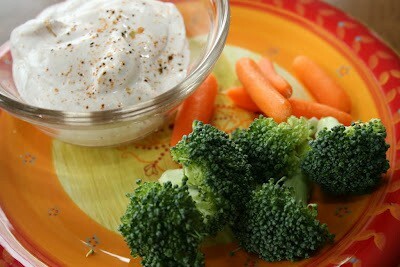 Follow Good Cook on Facebook, Twitter, and Pinterest for all the latest offers and great recipes. ◄Look for the “Add Me” graphic to select your drawer. I selected items based on the things I use when I cook! Plus I could not pass up that stuffed burger press and the knives. *Coarse Cheese Grater – Grates in BOTH directions, saving your wrist that achy feeling. And comes with a cover so you don’t catch it on things (like your knuckles) when you are searching in your kitchen drawer. Collapsible Funnel – Genius! Space saver and doesn’t catch on things in the drawer. 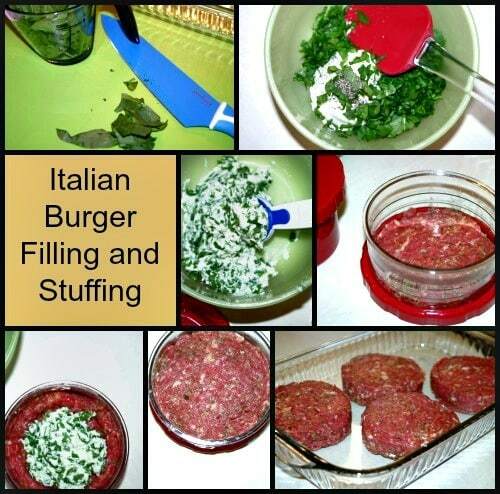 *Stuffed Burger Press – Makes the coolest stuffed burgers (see my recipe below!) or use it to make regular patties. Berry Colander – The prefect size to make it handy for rinsing anything small. *Rotary Grater – I have always wanted to have fancy fresh grated Parmesan cheese. Now I can! *Nonstick Sandwich Knife, 5″ – Slices bread perfectly. Enough said. Nonstick Utility Knife – Sharp and ultra-useful. Nonstick Santoku Knife, 5″ – This sliced my tomatoes so thin I could read a newspaper through them. I felt like an infomercial hehe. Nonstick Paring Knife, 4″ – Makes quick work of anything you need a small knife for. *Nonstick Chef’s Knife, 5″ – My favorite item in the drawer! I LOVE a great Chef’s Knife, and this non-stick version is super cool. The spinach I chopped slid right off the blade, and the weight was perfect to handle. *“Measure From Above” 3 Piece Liquid Measuring Cup Set – SO cool! You can see the measurements from the top. And it includes a supersize 4-cup measure. *Nylon Whisk – Nylon is a great in-between silicone and metal. Does a nice job whipping things full of air. *Spatula, Clear Handle with Silicone Spoon – Very easy to use, flexible, and heat resistant. *Cheese Slicer, Adjustable – I like fresh sliced cheese the best, and this adjustable slices delivered the exact thickness I wanted. *Instant Read Meat Thermometer with case – Food safety is a #1 priority in my kitchen and should be in yours. This is a must have for each and every kitchen drawer. In a large bowl, beat the egg then combine everything but the meat. Add meat then mix well. I use my hands. 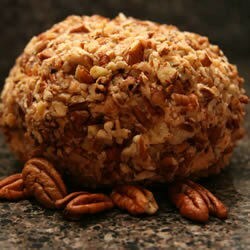 Form into a ball, then allow to rest while you mix the Spinach and Cheese filling. Combine Ricotta cheese, spinach, salt and pepper in a bowl. 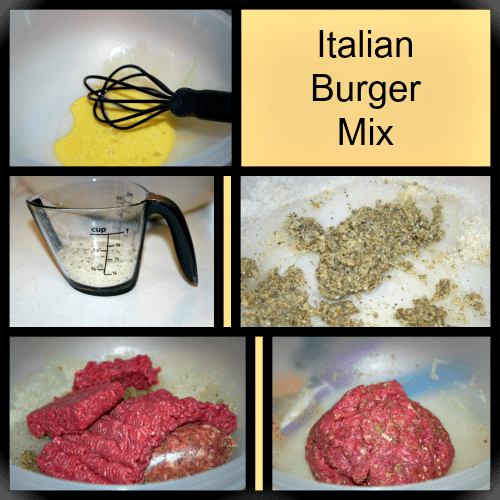 Divide burger mix into 8 portions. They will be approximately 4 oz. each. Place a portion in the burger press, press it then turn the press over and indent the burger patty to make a pocket for the filling. Use approximately one tablespoon of the filling and spread it to fill the cavity. Take another portion of meat and flatten it into slight patty shape, then place it over the filling taking care to make sure that it will all be sealed in when you press the two patties together, then press them evenly and remove the patty. Repeat until you have 4 complete burger patties. Heat grill to medium. Grill burgers covered for 8-10 minutes per side. These are thick burgers and will take longer than typical. Don’t use too high a heat or the filling will leak. During last minute of cooking time, grill buns and top burgers with mozzarella cheese. Check for safe internal temperature of 165° before removing from grill. 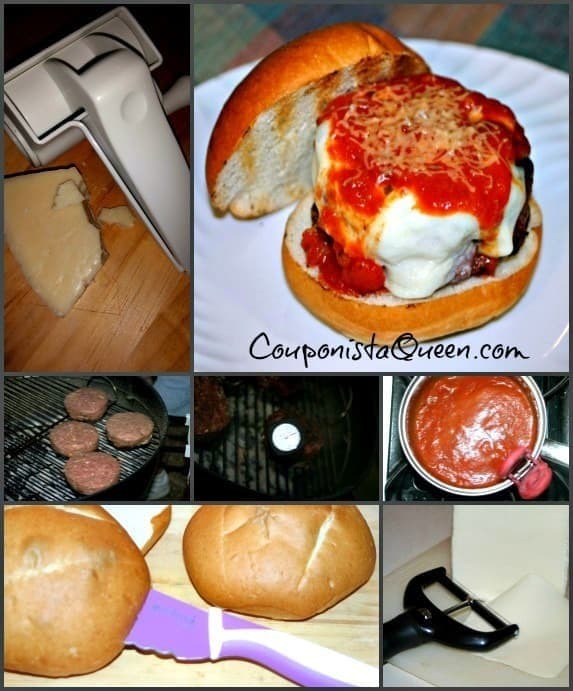 Put marinara on plate, place bottom bun then burger. Top with additional marinara sauce then Parmesan cheese. 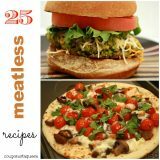 Goes nicely with Italian Mac ‘N Cheese with Caramelized Onions and Tomatoes, Breaded Parmesan Green Beans, or Grilled Yellow Squash with Garlic and Parmesan.